We all know what the Internet is but what in the world is the Othernet? (It used to be called Outernet). The Othernet is unofficially dubbed “The Internet in Space” or “The Encyclopedia in Space” and it’s mission is to provide internet type information to the poor or to areas on earth which don’t have active internet. I kind of view it as a back up to the internet and one more source of information in a SHTF scenario. When the grid goes down as long as you have an othernet receiver and a generator or some batteries and a laptop the satellite in space will probably still be working fine. The project is housed here. Before you jump into the Othernet fire for the first time, know this. When you buy Othernet hardware, that’s all you get. No manual, no instructions. Nothing. That being said one of the users over there made an amazing guide to setting up the Othernet. If you start digging into this guy a bit he’s highly credentialed and you can better believe this hobbyist believes everything he has to say in this paper. So it’s really all good. 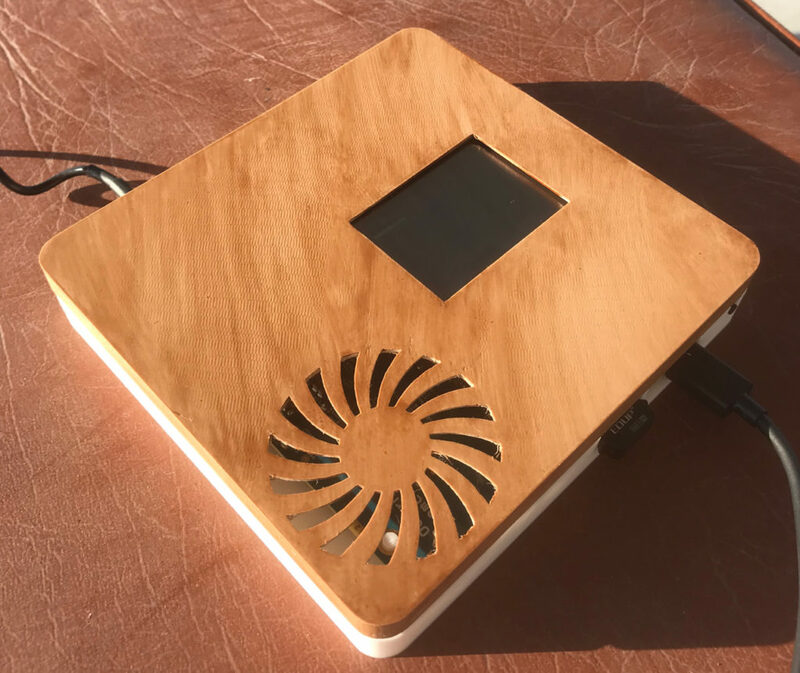 The hardware device used in this project is called a Dreamcatcher. The board was $150 and is now discounted to $99. Not sure if that is indicative of good news or bad news. 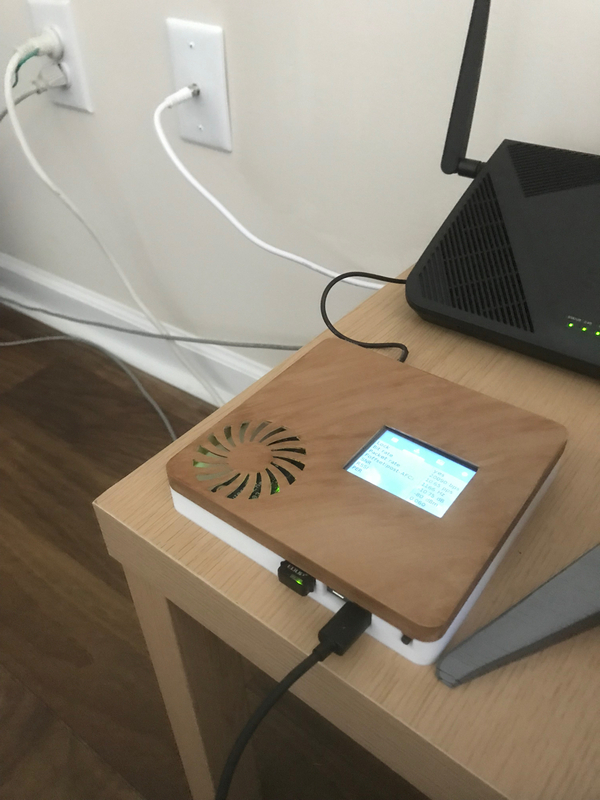 This is essentially the third iteration of Othernet and in fact a year or two ago I owned a DreamCatcher Version 2 board which is now obsolete. The project moved to a KU band satellite rendering the old hardware incapable of functioning as an Othernet receiver. The folks at Othernet are very up front about all of this and I encourage you to factor this in before you make the purchase. Read their whole page and their disclaimers. You might not want to spend the money once you do however I view this as a super cool project and I just have to have it. If it goes away and shifts to another satellite well by golly I’ll probably buy into that new hardware too. You simply cannot call yourself a geek if you’re not willing to take some high tech risks. Here’s the DreamCatcher and Antenna. THIS IS NOT COMPLETE NOR PLUG AND PLAY. • Coax to connect antenna to the adapter cable on the board. You read that right. You can’t even connect the antenna to the board right out of the box. None of this is a big deal if you read the user guide and web page before making the purchase. The stuff I have listed above is stuff any good geek has laying around the house anyway. Next you need to burn an OS onto the SD card. Download “Skylark” here. The latest version as of this writing is 5.2. Make sure you unzip the file to where the file name extension is .img That is the file you need to burn. Make sure you don’t attempt to do this if the file name extension is img.gz as that is the compressed, zipped up file. I copy the image file to the SD card old school from the command line with a program called DD (disk destroyer). Because I don’t want to destroy your disk and have you angry with me I’m going to tell you to download a program called Etcher. Plug in your SD card. 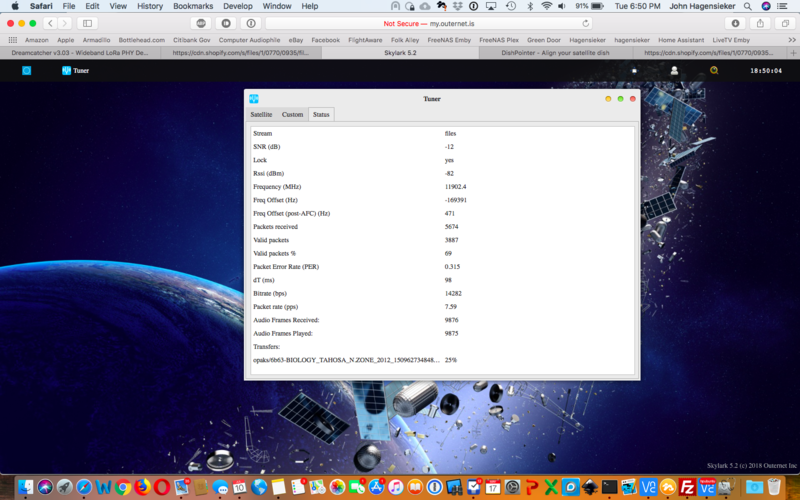 Download Skylark and select that file, make sure your SD card is detected and click FLASH. Wait. Done. Plug the SD card into the slot depicted in the yellow circle below. Hook up the antenna and boot. The wifi dongle on the left side of the pic will create a wifi Hotspot called “OUTERNET”. Hook your wifi up to that network, open a browser and paste the following into the address bar. Even though they changed the project name from Outernet to Othernet the login credentials and location still say outernet. I presume they’ll change that with the next Skylark upgrade. You’ll see the screen below (without the box being opened). In the upper left hand corner of the page is a blue square. That hides all the apps. You have to click on that to expose them. I have the tuner app open which shows you if you are receiving signal or not. At this point you should not be unless you are the luckiest guy or gal on earth. 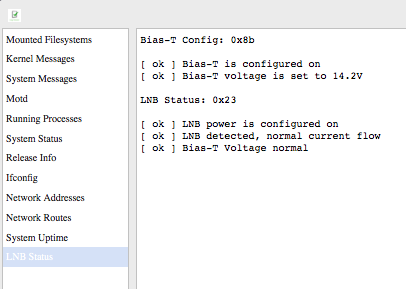 Once you are satisfied that all is working take the rig outside and set it up, but just before you do that open the Log Viewer and check the LNB status. There should be no lines here that says [fail] in them. When I first did this I had a brand new 6′ piece of RG6 Coax that causes a fail. That also goes a long way to explain why I couldn’t get TV in the camper reliably on my last outing with that hunk of coax. Anyway your Log Viewer should look like this entry. Check this first before you go satellite hunting. Now you can try to locate Satellite SES-2 which resides at 87 West. I used an iPhone app called “Dish Align” to find SES-2. There are lots of apps and of course you can do this with a compass as well. The best instructions are in the user guide I mentioned early on in this article. He did such a good job of writing them you should just follow them should you need help. Again. I just used dish align. 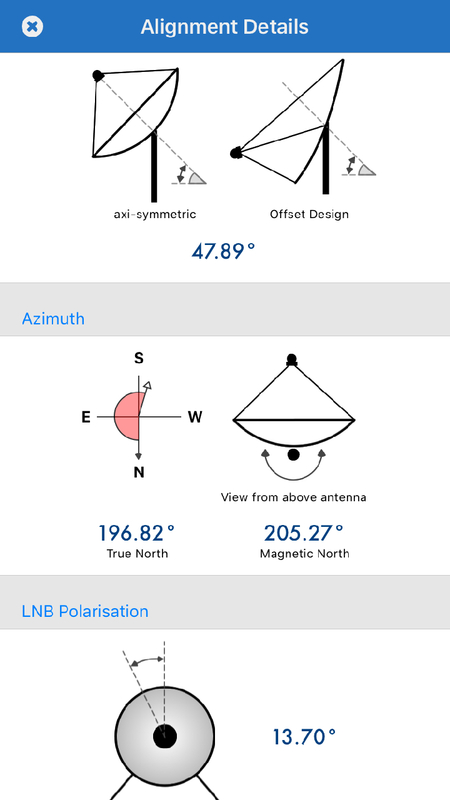 It points to the direction and then you have to find the elevation angle and the LNB Polarization (the twist of the antenna). All these variable differ based on YOUR LOCATION. Here’s how I temporarily set this up. 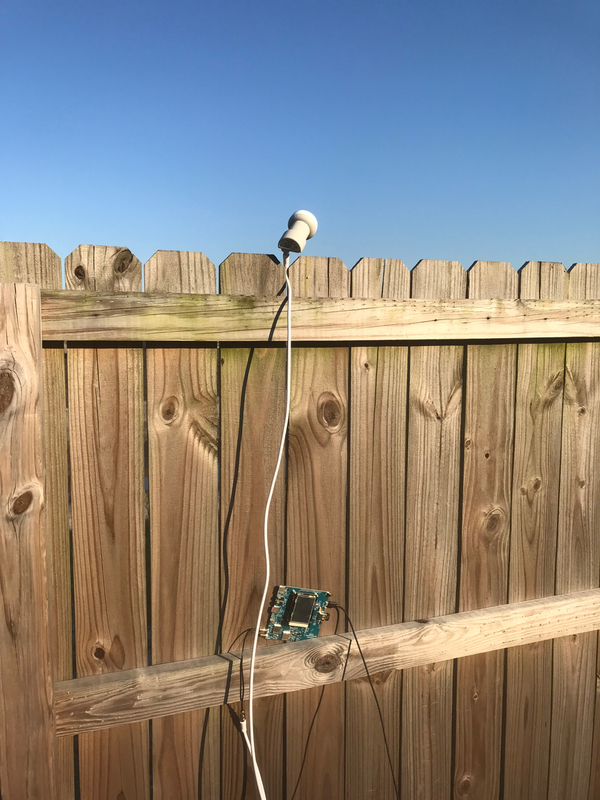 I literally jammed the coax between my fence posts and it held perfectly and I got a great lock on the satellite. It held for 3 days until I just took it down as we are anticipating storms today. 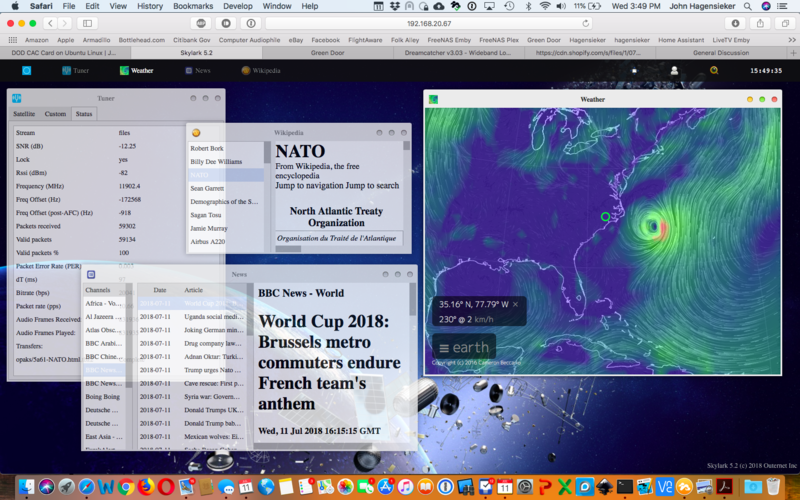 Here’s the News, Wikipedia, and Weather all opened after a day or so of downloading data. I hate to say this but I’m going to say it anyway. The Wiki and News are pretty clearly left leaning. There I said it. 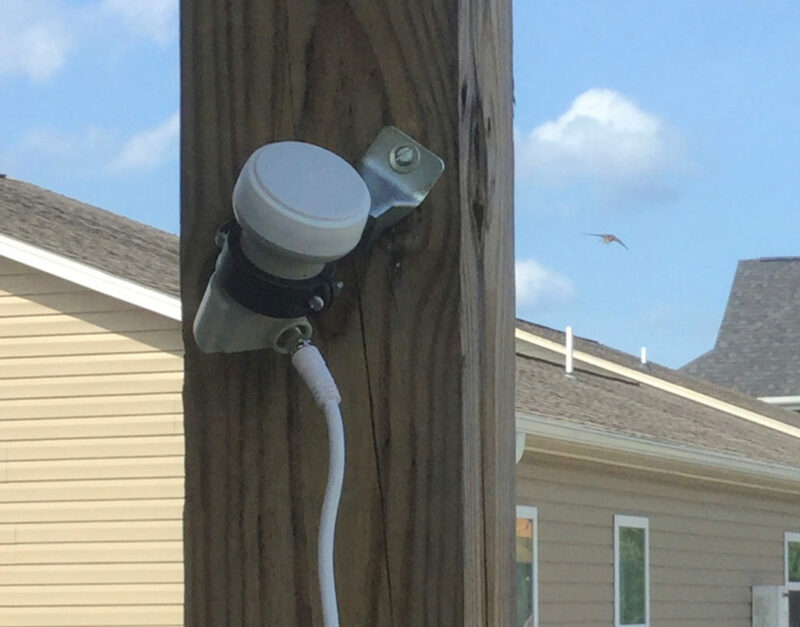 Got this LNB clamp to make the install more permanent. And lastly I 3D printed a case and printed the top with wood filled PLA, sanded it and stained it. And I finally popped a hole in the wall, installed a cover plate and set the Othernet board up in my den in a permanent installation. Love it. I realize this is not all inclusive guide but the one I made reference to earlier IS. Use it. I had some experience with the earlier iteration of the Dreamcatcher so it was pretty easy for me to set this all up. Your mileage may vary. Can’t go wrong with the excellent guide I linked earlier. You are now an Othernet guru. 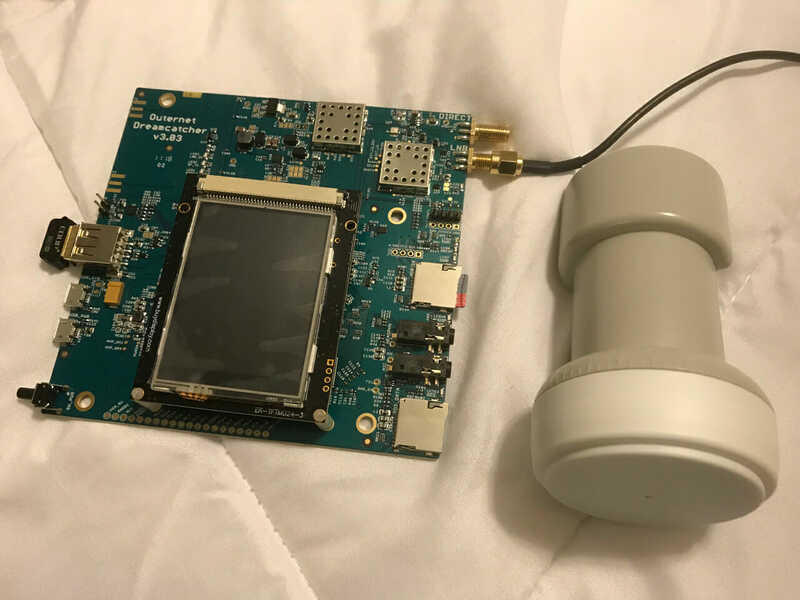 This entry was posted in SDR on July 12, 2018 by John Hagensieker. how look what outernet offered me? for example how check wikipedia data or books without device. I only would like to check what is in outernet inside.